5- The Problem of Procrastination and Self-Control Why We Can’t Make Ourselves Do What We Want to Do? Here again one of the most important points covered in this book, Procrastination. Or in other words, why we can’t make ourselves do what we want to do? What is holding us? Why the American scene suffered the biggest decline in the personal savings rate since the Great Depression? Why do we lose the fight against procrastination so frequently? Maybe the following experiment could tell us few answers about this. In one semester, Ariely decided to give it a try with a cool experiment that might study the effect of procrastination on his students. He had 3 classes that were assigned to him that semester, students from each class has to submit 3 papers that will massively contribute to the final grade. As part of the experiment, he decided to give each class different deadlines. The First class — let’s call it Class A — have been told to choose their deadlines for the 3 papers. In other words, each student from class A needs to pick up a deadline for each paper by himself/herself, however, each student will be penalized if he/she failed to deliver it on the specified timing. The second class — Class B — were given the freedom to hand over papers any time they find suitable for them until the end of the semester. While the last class, Class C — were given sharp deadlines by Ariely to submit their papers. The result of that experiment was that Class C got the best grades despite the rigid deadlines they were put in, Class B with the worst grades, and Class A in the middle between them. not everyone understands their tendency to procrastinate, and even those who do recognize their tendency to procrastinate may not understand their problem completely. Yes, people may set deadlines for themselves, but not necessarily the deadlines that are best for getting the best performance. Reflecting such behavior on our day to day activities, we found people all the time struggling with diet, Doctor appointments, saving money …. etc. For the money-saving example, in fact, the author discussed a cool credit card idea. Imagine we have self-controlled credit cards that we can set in advance the amount we need to spend in each category over a period of time. For example, Cardholders could fix their limit for groceries at $200 a week and their entertainment spending at $60 a month, and not allow any spending on candy between two and five PM … etc. As sound as it looks like this idea was, however, people from the banking industry whom the author talked to didn’t give any interest in such idea, maybe after all this could harm their money making a strategy. What’s the bottom line? We have problems with self-control, related to immediate and delayed gratification — no doubt there. But each of the problems we face has potential self-control mechanisms, as well. If we can’t save from our paycheck, we can take advantage of our employer’s automatic deduction option; if we don’t have the will to exercise regularly alone, we can make an appointment to exercise in the company of our friends. These are the tools that we can commit to in advance, and they may help us be the kind of people we want to be. 6- The High Price of Ownership Why We Overvalue What We Have? 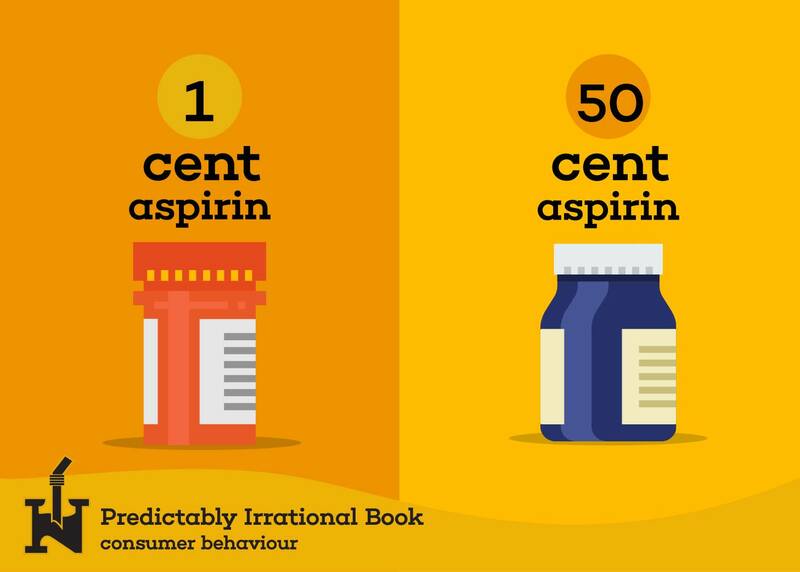 The Placebo Effect, Why a 50-Cent Aspirin Can Do What a Penny Aspirin Can’t? If you were living in 1950 and had chest pain, your cardiologist might well have suggested a procedure for angina pectoris called internal mammary artery ligation. In this operation, the patient is anesthetized, the chest is opened at the sternum, and the internal mammary artery is tied off. Voilà! Pressure to the pericardiophrenic arteries is raised, blood flow to the myocardium is improved, and everyone goes home happy. That was one of the most successful operations back in its times. However, in 1955, a cardiologist in Seattle, Leonard Cobb, and a few colleagues became suspicious. They questioned the efficacy of the procedure and decided to put the theory back in the test. Cobb decided to perform the operation of half of his patients and fake it on the other half. The result was quite impressive. Both patients who did the real procedure and the fake one reported immediate relief from their chest pain. In both groups, the relief lasted about three months — and then complaints about chest pain returned. In the same time, electrocardiograms showed same findings on patients with the real operation as well as on those with the placebo one. Now we came to the end of this book sip, we hope that our work here was valuable for you. If you have any feedback or have any recommendations feel free to contact us on any social media channel we are in. Thank you for your time and stay tuned for our next sip.